Although private charter flying has been available for decades, air travel has become much more sophisticated in recent years with the maturation of private jet companies and the industry overall. On one hand, the need for people to avoid endless airport queues and aggravating commercial airline terminal security procedures has paved the way to a simpler way of flying — in a private aircraft. But on the other hand, jet planes are still intimidating for people who associate private flying with increased costs and limited options. Because we want to make private aviation more accessible and better understood, we’ve shed some light on the assumptions people make about flying private. MYTH: It’s just for the rich and famous. Reality television and music videos have exposed us to seeing the most affluent fly private jets as frequently as some of us make our morning commute. Seeing these celebrities fly private so often has created a perception that only pop stars or millionaires travel by private airplanes — only they can afford to own or charter a private aircraft. But you don’t have to own a private jet to fly in one. In reality, most private jet companies offer charter flights for business. That means you only buy the flight needed and use the aircraft for your travel. No need to worry about operating and maintenance costs. Plus, flying private isn’t as expensive as you think. The cost comparison between private and commercial flights isn’t always a simple as the ticket price. Flying commercial for business adds the expenses of a full day of employees airline travel, car rental, hotel, per diem for each traveling team member and a full day of travel on either side of the meeting date. That adds up to three days out of the office for just one meeting. Additionally, because employees can meet, plan and work with each other aboard a private aircraft, they can still be productive en-route to the meeting. With private aviation, meeting attendees are on time — and home for dinner with their family that same evening. The cost of a commercial airline trip for a business team can sometime be near equal to that of a private aviation trip, and the boost to team morale is priceless. MYTH: The destination list is limited. Commercial aircrafts follow a predetermined route with a limited list of fixed destinations, and the destination of your choice might not be available. Flying private opens up more gateways than you might think. Flying private means more flexibility and arriving closer to your final destination if there’s a small local airport nearby. There are at least 5,000 airports accessible to private charter aircraft, many of which are only a few miles from any destination you would need to go — all of this convenience without any lengthy layovers. Because private jet companies have access to places commercial planes don’t, itineraries are more flexible and accessible. Flying private for personal trips or vacation creates a diverse list of exotic, off-the-beaten-path destinations. MYTH: Private jets aren’t as safe. If you’re not used to being flying private, you might worry about the safety and run through all the possible scenarios that could go wrong. Many believe commercial planes to be much safer. But that simply isn’t the case. Statistics show that both private and commercial air travel are equally safe. Public airlines and private jet charters are both required to follow FAA regulations for crew duty and rest, runway conditions, fuel and a long list of other safety conditions. The more sophisticated the charter operator, the more safety guidelines and procedures it is obligated to abide by for compliance. The highest tier charter operators abide by regulations and inspections that rival and often exceed some airline requirements. MYTH: Flying commercial is faster than flying private. Private jets typically fly the same airspeeds as commercial airline aircraft. Turboprop aircraft fly slower than airline jets, but the slower airspeeds are more than offset by all the other benefits of private aviation. Private aircraft passengers forego the long security checks and don’t have to follow the general rule of thumb to get to the airport 90 minutes in advance for domestic flights and three hours for flying internationally. This doesn’t even account for the drive to the large terminal, parking, airport shuttle and loading procedures of the commercial airline process. When you fly private, you can drive your car right next to the chartered aircraft, loading your personal belongings, buckling up and taking off in as little as twenty minutes. For example, if you’re flying to New York City for a business meeting, we’ll have you sitting down at the conference table in New York City even before a commercial airline would have taken off at a major commercial airline hub. That’s a huge difference! MYTH: Passengers experience the same level of comfort. Flying business class on a commercial airline can be a luxurious experience: expansive legroom, comfortable reclining seats, endless Champagne, and expertly prepared airline cuisine. But in a private jet, passengers have an unparalleled experience. 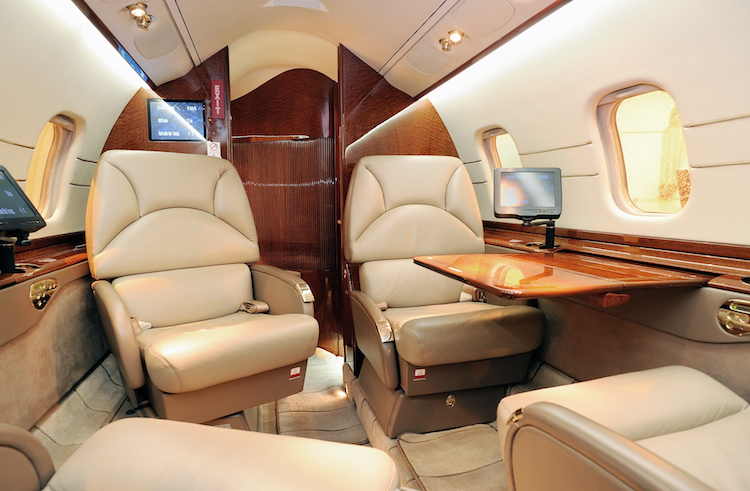 Instead of a few extra inches of legroom, private jets offer the entire space for you to relax and spread out. Plus, the food menu is up to you. For business travelers, flying private gives you a level of privacy that is unmatched by commercial airline travel. On a private jet, your travel time can also be productive meeting time with your team — many jets now include high-speed internet. If you’re traveling with family or friends in tow, flying private allows you to truly relax and enjoy the flight itself as part of the overall experience. When you fly private, the journey is the destination. Book your journey with Mountain Aviation today.